Nobody knows how many people die globally from measles. Global death statistics and statistics claiming to prove how many lives are saved by vaccinations are produced via computer modelling through the use of assumptions and mathematical algorithms. Two modelling systems are used: Lives Saved Tool (LiST) is used increasingly by donor organizations, and the WHO/IVB model used by the World Health Organization’s Department of Immunization, Vaccines and Biologicals. For example, WHO modelling assumes that all unvaccinated children will have a measles infection by their 20th birthday , and a proportion of those cases (ascertained by expert panel) would die from measles. The LiST tool assumes that the ‘herd’ is protected when vaccination coverage reaches 90%, even though we know that outbreaks still occur in areas with 99% vaccination rate . As an example of how these different modelling systems, with their inbuilt assumptions, can affect the numbers, researchers estimated measles deaths for the year 2000 via the two modelling systems. One model estimated 671,521 deaths, while the other model estimated 224,084 deaths – less than half . 2. Measles is notoriously hard to diagnose. Once upon a time, anybody with a fever and a generalized rash may have been diagnosed with measles. In 1998, only a mere 14% of measles diagnoses turned out to be correct in Australia  (Even today, 1 in 10 of all medical diagnoses are incorrect, according to the Society to Improve Diagnosis in Medicine ). Diagnostic bias promoted by health authorities. For example, the CDC advice to health professionals is “To minimize the problem of false positive laboratory results, it is important to restrict case investigation and laboratory tests to patients most likely to have measles”. Those “most likely” to have measles, of course, are the unvaccinated and those who’ve recently travelled abroad. This, of course, serves to reinforce the current paradigm that vaccination ‘works’ and measles has been eliminated from the US, and the only reason outbreaks still occur is because of travellers and the unvaccinated . 3. Vitamin A saves lives…but apparently is not as profitable as vaccines. It has been known for decades that supplementing with Vitamin A substantially reduces mortality rates from infectious diseases in developing countries. In the case of measles, Vitamin A supplementation can halve the mortality rate . In the early 1990’s, control of Vitamin A deficiency in developing nations was declared a major international goal, and lauded as possibly the most cost effective of all health interventions [8-9]. This is because sufficient levels of Vitamin A not only benefit overall health and immunity, but also prevent blindness. Why is it then, that decades later, a country like Rwanda has a 98-99% vaccination rate, but only 3% rate of Vitamin A supplementation ? In developing countries, Vitamin A may be administered intravenously in hospitalized measles cases, but oral Vitamin A supplementation is not promoted for home use (which would potentially avert the need for hospitalisation) . First, his team obtained ‘throat washings and blood’ from an 11-yo boy with measles named David Edmonston. When he added it to a specimen of ‘post-natal cells’ (cervical cord? Infant foreskin? ), these cells fell ill. He assumed this was caused by the measles virus. He then added the mixture to a culture of HeLa cells – human cervical cancer cells that are so aggressive, and so prolific, they have managed to contaminate many cell lines all over the world. The fluid that ran out, he poured onto a second culture of cells, and then a third, and so on, until he could see under microscope ‘giant multinuclear cells’. He attributed this to measles virus, not to aggressive cervical cancer cells. He then passaged the fluid through human kidney cells numerous times, followed by numerous passages through human amnion cells, each passage undoubtedly creating more stress and mutations for the cells. When he injected the resulting fluid into monkeys, some got a ‘mild illness’ that in ‘some aspects’ resembled measles. This was all the proof Enders needed, that he had isolated the viral culprit causing illness in kids. Enders decided using monkeys was too expensive, so went with chicken embryos to save costs, and today’s vaccine is still prepared on chicken eggs . In 1973, the British Medical Journal published a case study, describing remission of infantile Hodgkin’s disease after natural measles infection . The 23-month-old child developed measles, before radiotherapy could be started, and the researchers noted, “much to our surprise, the large cervical mass vanished without further therapy”. In fact, vaccine-strain measles is currently being investigated as a potential treatment for cancer, with early results deemed as “promising”, with open trials still being conducted . Earlier research stated that attenuated live measles virus demonstrated “propensity to preferentially infect, propagate in, and destroy cancerous tissue” . It was explained that the reason for using modified viruses was “concerns regarding the potential of wild-type-viruses to cause serious side effects, technical limitations in manufacturing viral lots of high purity for clinical use, as well as the overwhelming excitement and fervent support the, at the time, newly emerging chemotherapy approaches that slowed down research on alternative strategies ”. (Note also that a laboratory-engineered virus strain can be patented, which makes it much more desirable for drug companies). In 2014, CNN aired the story of a woman with incurable multiple myeloma, who had already endured every type of chemotherapy available for that kind of cancer, two stem cell transplants, yet relapsed time and time again . Scientists from the Mayo Clinic injected the woman with a genetically-engineered measles virus. The woman than experienced a high fever of 105, and vomiting (but declared it was the ‘easiest treatment’ she’d done by far). She went into remission for nine months, and then a small growth had to be removed surgically. But was it the ‘measles’ virus that affected the cancer, or was it the purgative and cleansing action of the fever and vomiting – self-correcting mechanisms of the human body that are now largely suppressed through modern medicine? In 1890, a young surgeon at New York City’s Memorial Hospital became dismayed at the frequent failures of surgery to treat cancer. His name was William Coley. He began to dig through the records of the hospital, and was intrigued to find the case of an immigrant dockworker, who was admitted to the hospital with a malignant tumour on his neck. He was later discharged without any treatment…and without any further sign of tumour on his neck . William Coley tracked the man down, and found him in good health. It turned out that while the man was in hospital awaiting surgery, he developed a severe case of erysipelas, a painful red inflammation on the skin, accompanied by high fevers. The sarcoma on his neck vanished. Coley began to experiment on those with inoperable cancers, by injecting bacterial endotoxins to produce a high fever, with an estimated cure rate of 60% (far surpasses the success rate of today’s treatment for stage 4 cancers). Note that the treatment was only successful if fever and skin eruption could be induced. His product, Coley’s Toxins, was used all over the United States and Europe, but in the post-war years, when science and medicine were enthralled by the promise of ‘cutting edge’ technology such as radiation and chemotherapy, ‘fever therapy’ fell out of favour, and in 1962, Coley’s Toxins were banned by the Food and Drug Administration. Ironically, ‘immunotherapy’ to treat cancer is now regarded as the ‘hottest area of cancer research’ . Perhaps, if we looked at why people’s immune system had become so dysregulated to start with…? While still on the subject of measles, it would appear the current MMR vaccine was approved without having been tested in clinical trials, but rather, based on studies of the individual components. The vaccine insert for the current MMR II vaccine references numerous studies, but they are ALL for the individual components of the vaccine, not the MMR vaccine . There is one (small) study mentioned that appears to have been based on the MMR II vaccine but…no references are provided. Clinical trials are generally conducted in phases of ever-increasing numbers of participants. Phase 1 trials usually involve 20-100 healthy volunteers. Phase II usually involves 100-300 volunteers from the target market. And phase III usually involves 300-3000 volunteers from the target market. So, we’d expect to see more than just one study referenced for a new vaccine. A visit to Merck’s website leaves us none the wiser. The same small study is promoted, but still, puzzlingly, no references are given for said study . Additionally, Merck stopped making the single vaccines in 2009, so if one wanted to be vaccinated for ‘measles’, they must have the triple-antigen vaccine . Chen WJ. 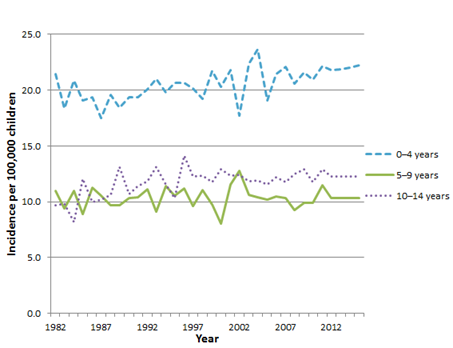 Comparison of LiST measles mortality model and WHO/IVB measles model. BMC Public Health. 2011;11 Suppl 3(Suppl 3):S33. Published 2011 Apr 13. doi:10.1186/1471-2458-11-S3-S33. Boulianne N, De Serres G, Duval B, Joly JR, Meyer F, Déry P, Alary M, Le Hénaff D, Thériault N. Département de santé communautaire, Centre Hospitalier de l’Université Laval. [Major measles epidemic in the region of Quebec despite a 99% vaccine coverage] [Article in French]. Can J Public health. 1991 May-Jun;82(3):189-90]. Francombe H. Measles diagnosis unreliable, Australian Doctor, Feb 18, 2000.]. Centers for Disease Control and prevention, Manual for Surveillance of Vaccine-preventable Diseases: Measles, https://www.cdc.gov/vaccines/pubs/surv-manual/chpt07-measles.html. Accessed February, 2019.
 WHO, Manual for the Laboratory-based Surveillance of Measles, Rubella, and Congenital Rubella Syndrome, https://www.who.int/immunization/monitoring_surveillance/burden/laboratory/manual_section4.2/en/. Accessed February, 2019. SOMMER A. Vitamin A prophylaxis, Archives of Disease in Childhood 1997;77:191-194. World Bank. World development report 1993: investing in health. Washington DC: World Bank/New York: Oxford University Press, 1993. National strategies for overcoming micronutrient malnutrition. 45th World Health Assembly (agenda item 21), 1992. World Health Organisation, Geneva. UNICEF, Statistics: Rwanda, https://www.unicef.org/infobycountry/rwanda_statistics.html#114. Accessed September, 2017. Mayo Clinic, Measles: https://www.mayoclinic.org/diseases-conditions/measles/diagnosis-treatment/drc-20374862. Accessed February, 2019. Enders J et al, Measles Virus: A Summary of Experiments Concerned with Isolation, Properties and Behavior, Am J Pub Health, 1957, 47(3):275-282. CDC, Prevention of Measles, Rubella, Congenital Rubella Syndrome, and Mumps, 2013 Summary Recommendations of the Advisory Committee on Immunization Practices (ACIP), MMRW, 2013, 62(4), pp 8. Mota C. Infantile Hodgkins’ disease: remission after measles. BMJ, 1973; 2(5863): 421. Aref S, Bailey K, Fielding A. Measles to the Rescue: A Review Of Oncolytic Measles Virus. Viruses, 2016; 8(10):294. Msaouel P, Dispenzieri A, Galanis E. Clinical testing of engineered oncolytic measles virus strains in the treatment of cancer: An overview. Curr Opin Mol Ther, 2009, 11(1): 43-53. CNN, Measles virus used to put woman’s cancer into remission, https://edition.cnn.com/2014/05/15/health/measles-cancer-remission/index.html. Accessed February, 2019. 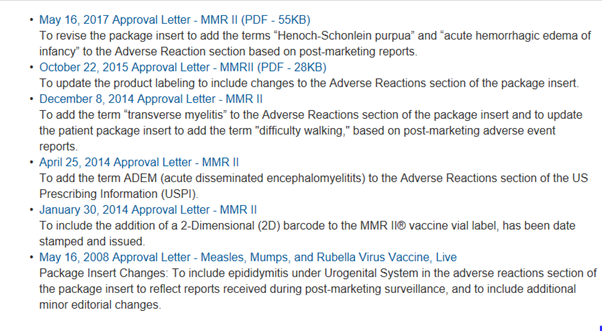 FDA, MMR II vaccine, https://www.fda.gov/downloads/BiologicsBloodVaccines/UCM123789.pdf. Accessed February 2, 2019. MerckVaccines.com, Seroconversion Rates, https://www.merckvaccines.com/products/mmr/seroconversion-rates. Accessed February, 2019. FDA, Measles, Mumps and Rubella Virus Vaccine, Live, https://www.fda.gov/BiologicsBloodVaccines/Vaccines/ApprovedProducts/ucm094050.htm. Acessed February 2, 2019. CDC, Q&A’s About Monovalent MMR vaccines, https://www.cdc.gov/vaccines/hcp/clinical-resources/mmr-faq-12-17-08.html. Accessed February 2, 2019.